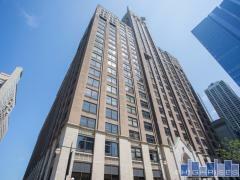 Three Sixty West is a luxury condo building in Chicago's River North neighborhood. The exclusive building consists of just 38 homes. Each residence offers a unique 3 bedroom floor plan. The building boasts an array of amenities including a rooftop lounge and sundeck, fitness center, and dog run. Have any comments or questions about Three Sixty West? Ask your question and/or share your thoughts about this Building.